Holiday gatherings with family, friends, and neighbors is a most welcoming time. When the dining table is given extra attention and added detail, it is even more so. We believe a table dressed with fine linens and candles, which extend into the kitchen and the guest bath, set the perfect mood for guests and for the host and hostess. Fine European linens for formal and informal dining. Grand candles for elegant beauty. Simple lines, meticulous details, pure cotton and virtually carefree! Classico Thanksgiving One of the world's finest table linens has become an American classic. Woven in Italy, Classico's border of delicate, refined hemstitching, each thread drawn and wrapped by hand, underscores the beauty of handwork married with the elegance of fine linen. Heirloom linens for generations to come. Refined elegance with tone-on-tone organic allover jacquard design. From crisp white to subdued ivory to rich ruby. Combining design, thread, weave, color, and lighting, a tone-on-tone jacquard is exquisite at any occassion. pendants set majestically into the center of a multi-faceted Baroque frame. Spellbinding patterns of light glimmering with intense hues. Pure elegance and sophistication. What color will you choose this holiday? Dress your table in elegant linen, cotton or easy-care poly fabric to suit your lifestyle. Gather Around the Table Motifs carefully placed. Composition carefully orchestrated. Choose your Manege colorway and let the show begin! Elegant silhouettes of horses and riders parade around the center panel framed by horses, saddles, bridles, roundels, and spurs. A spirited way to dress for your upcoming holiday hoedown! All the images of Christmas are woven into Sous la neige - boughs and pinecones, foliage and crossstitched patterns. Inspired by thick forests and mountain chalets. Limited edition Holiday collection. Boughs and pinecones, foliage and cross-stitched patterns. Sous la neige is a limited edition Holiday collection. For holiday last-minute & holiday dreams Our Gift Certificate – the perfect gift for that oh-so-dear, yet hard-to-buy-for person in your life. You decide the amount and we will email them the wonderful news inside our lovely card. Simple and sincere. 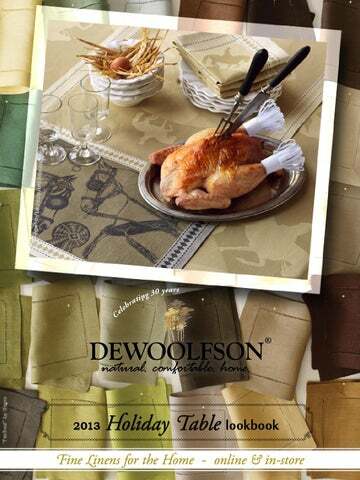 Create your Gift Registry at www.dewoolfsonlinens.com – the perfect and easy way to create a wishlist for yourself or someone else when those special occasions arise. natural. comfortable. home. DEWOOLFSON LI N ENS 9 452 NC H ig hway 105 Ba n ner El k, NC 28604 U.S.A.
© 2013 DEWOOLFSON DOW N I N T’L ., I NC.